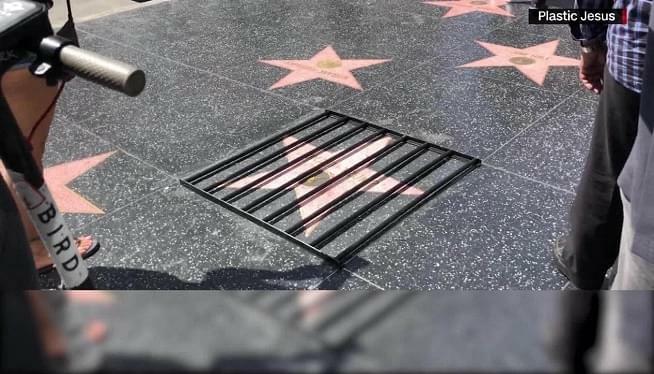 President Donald Trump’s star on the Hollywood Walk of Fame was defaced yet again this week, this time covered by wooden bars affixed with industrial, double-sided tape. A local street artist known as Plastic Jesus — who’s messed with Trump’s star in the past — explained his method to CNN’s Jeanne Moos, along with the logic behind the bars. “Well, ’cause (Trump’s) going to jail,” he said. It had been only weeks since Trump’s star, unveiled in 2007, got its last facelift — a recurring need since the President entered politics. A 24-year-old man was arrested in July after the star was pulverized with a pickax. It was returned to the Walk of Fame on September 8, according to the Hollywood Chamber of Commerce. Two years earlier, Plastic Jesus constructed a tiny wall around the star, an allusion to Trump’s proposed border wall with Mexico. “I try to do my pieces in a way which doesn’t vandalize the Walk of Fame too much,” he told Moos.